Sophomore defender Nora Byrne runs downfield with the ball. 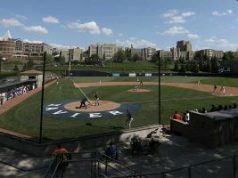 The Bulldogs (3-8, 0-1 BIG EAST) started off their Big East schedule Saturday afternoon, falling to Georgetown (7-4, 1-0 BIG EAST), 21-3. The Hoyas put their foot on the gas pedal early and didn’t let up all game. Georegtown netted their first goal of the game just over a minute in when Taylor Gebhardt scored her 23rd goal of the season. The Hoyas went on to score five more unanswered goals and took a 6-0 lead over the Bulldogs. 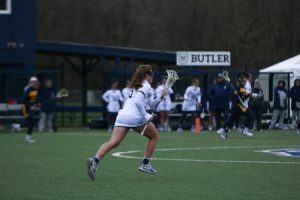 Butler finally got on the board when Madeline Hooks scored on a free position goal. Kalie Callaghan scored Butler’s second goal of the game with just under eight minutes. However, the Hoyas finished the half with five unanswered goals and took a 13-2 leading into halftime. Georgetown’s momentum carried into the second half, as they outscored Butler 8-1 led by two more goals on the game for Liza Liotta. 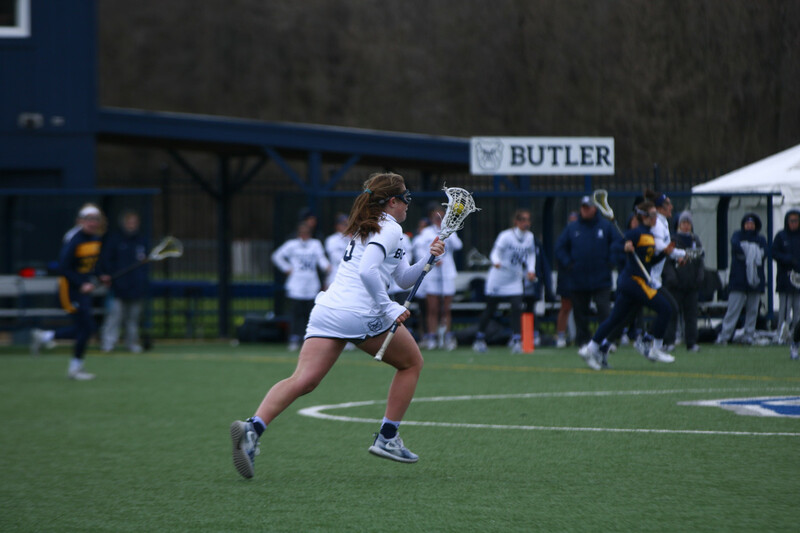 Butler’s only goal of the half was scored by Hannah Justice at the 14 minute mark. Liotta controlled the Georgetown offense with four goals, while Taylor Gebhardt netted three of her own. Goalkeeper Haelle Chomo (7-3) received the win, making seven saves on 10 shots. Amanda Rumsey (3-7) got the start in goal for the bulldogs, however all three goalies saw action. Rumsey made four saves and gave up 13 goals. First year Katie McGrath (0-1) allowed five goals and saved four in 20 minutes of second half action. 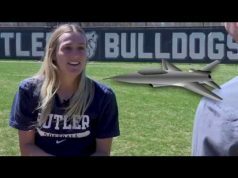 Finally, Haley Rayburn closed out the final nine minutes for the Dawgs, allowing just 3 goals and saving one. 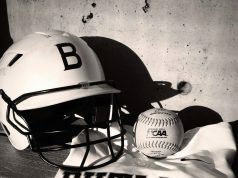 The Butler Women are back in action Tuesday at Noon as they make the trip to visit the Cincinnati Bearcats.